Our seal driver sets include discs and handles for custom seal driver assembly. They provide a pilot that prevents cocking, a spacer to ensure that force is applied to the correct area and a driver to ensure that force is distributed evenly. Discs on our bearing driver sets range from 12.7 to 114.3 mm diameters in 1.6mm increments. Each bearing and seal driver set includes a handy plastic box with pre-cut tool tray. Regardless of whether you’re looking for a bearing driver kit, a bushing driver set or a seal driver kit, take a look at the full range below. There’s sure to be something for you. A bearing driver tool is perfect for replacing wheel bearings without damaging the axle housing. 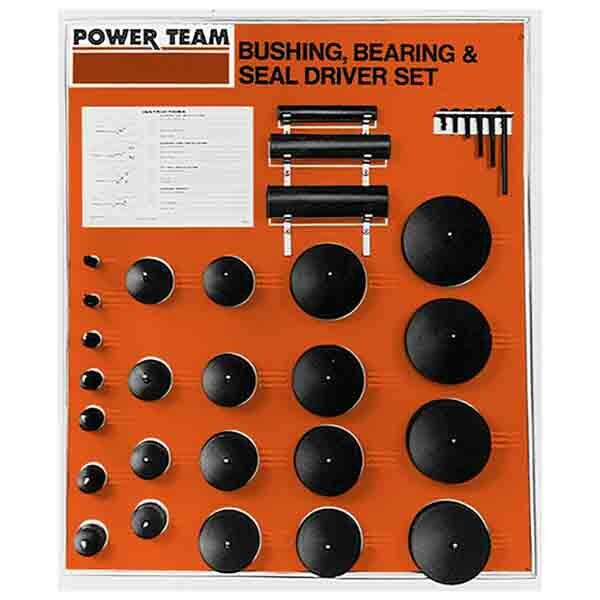 With a Power Team bearing driver kit, you’ll be able to customise your kit to make it suitable for cars, motorbikes or any application that has bearings or seals. With our bearing driver sets, the adaptors can be changed quickly and easily so that a wide range of bearing combinations can be accommodated by the bearing driver tool, so you can complete a wide number of jobs without having to switch bearing drivers. Why Buy Bearing Drivers with Us? When you buy a bushing driver tool or seal driver set with us, you qualify for free returns for up to 60 days. Plus, if you spend over £50 on any of our bearing driver tools or bushing driver sets, you’ll qualify for next day delivery. So check out the full range of bearing seal drivers and bearing driver tools today or contact us on 01332 576 850 to learn more.